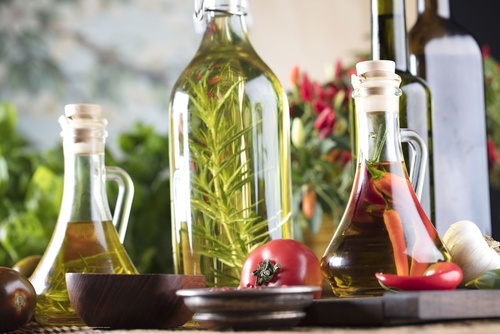 Flavored or infused oils can be a great way to add flavor to marinades and dressings. But if you plan to make flavored oil at home, there are some things you need to keep in mind. If you want to try your hand at making flavored oil, here are some tips to keep you safe. Consider using dried ingredients. Dried herbs and spices do not contain water and are safer. Sanitize your containers by boiling them. Items must be boiled for 10 minutes in order to kill C. bot. This recipe uses chopped fresh herbs and lemon zest. This oil is heated on the stovetop. It is a good base for some other recipes. This oil combines garlic and lemon zest with olive oil. It is great for drizzling over seafood and dipping bread. This recipe is an alternative to using just red pepper flakes to spice up your Italian dish. This is a simple recipe that you can make with rosemary or herb of your choice. It's also great to make as gifts!